“Out of stock” status on Ebay allows to keep a listing on eBay even if product has no stock. To learn more about this eBay feature, read this article. 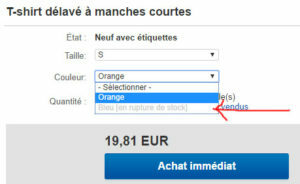 2/ Make sure to activate “out of stock” feature in your eBay account. For this, you can go to My eBay > Account > Site Preferences. In “Selling Preferences” you can open “Sell Your Item form and listings”, and choose “Yes” “Use the option out of stock”. 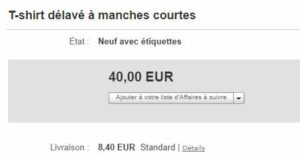 With above prerequisites, “Out of stock” feature is automatic : 0 stock products (or negative stock) will be flaged on eBay as “Out of stock”. When stock is back in PrestaShop, listing are reactivated on eBay. For mono variation products, the button “Buy Now” no longer appears on the eBay ad. For multi-change products, the stock change to 0 will appear grayed out “Out of stock”. Example below with S Blue.